For those who live in the desert, one must always be on guard of the dreaded scorpion. These creepy crawlers are seen on a yearly basis in arid areas of the globe including some parts of southern Alberta during summer. Of the more than 1,500 species know, most scorpions only delivered the equivalent to a bee sting and are not poisonous. However, for Canadian star gazers, the great scorpion makes its brief appearance in southern skies from May to September. The next few weeks will be your last chance to chase down some objects before Scorpio slithers below the western horizon and hibernates for winter. From our vantage point in Canada, we cannot enjoy the entire constellation as part of the tail dips below our horizon. Only the stinger stars pop above the south for a short while. As asterisms go, Scorpius truly looks like a scorpion. From its curved body to the three suns that make up its body, Scorpio stands out. The first magnitude Antares (the heart of the Scorpion) is often mistaken for the planet Mars, is the heart of the Scorpion – Antares beams at first magnitude and lies some 600 light years away. Even its name Ant Ares means “like Mars” with Ares being the Greek word for the “god of war”. Proclaimed as the thirteenth brightest star in the visible sky, it is a true supergiant star in every sense of the word. Having Antares as our Sun would spell disaster for our world and the solar system as it would stretch past the asteroid belt. Our supergiant friend is slowing losing material via its stellar winds and will someday explode as its core squeezes to become iron. The lost material now surrounding Antares is trespassing into the constellation Ophiuchus. This complex region of nebulosity is known as the Antares/Rho Ophiuchi region. 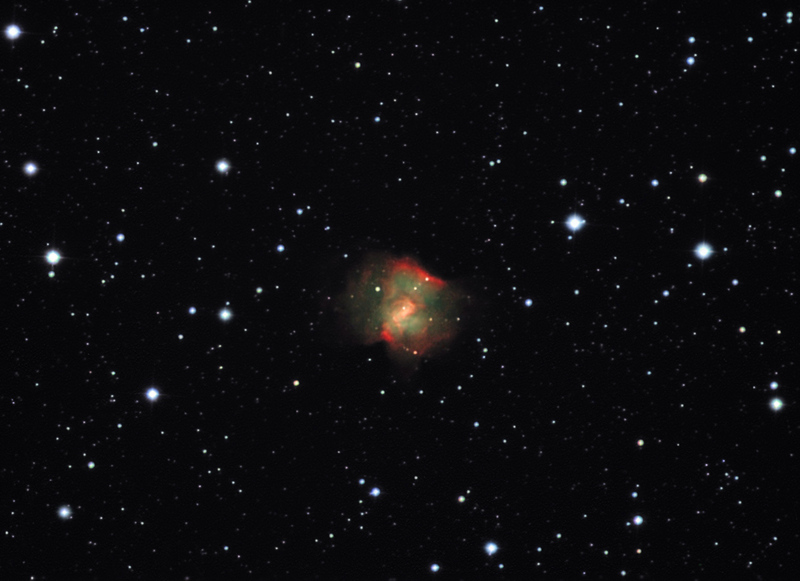 Astrophotos bring out the lovely colour composition and immense size. IC4604, IC4606 and Ced 130 take up four and a half degrees by three degrees of sky. Rho Scorpii is an extremely hot star. Shining blue-white in colour, its surface temperature is a little more than 21,000 degrees Kelvin. This places it as a B2 sub dwarf. At a distance of 415 light years, Rho A shines brighter than 2,500 times that of our Sun. Rho also has a spectroscopic binary that orbits in four short days. Rho B on the other hand can be found some 40 arc seconds away and lists at 13th magnitude. It takes Rho B some 114,000 years to orbit its parent star. Delta Scorpii was in the news nine years ago as it suddenly went into outburst. Normally shining at magnitude 2.3, it brightened to 1.9 and still flared up into 2005. Also known as Dschubba, it has a second close star that orbits every 20 days but in a highly eccentric orbit. It is beieved these two bodies had a extremely close approach in the middle of year 2000 and set off the outburst. Scorpius is home to mostly open and globular clusters as well as couple of planetary nebulae. Only a handful of galaxies – mostly in the magnitude 14 range, reside within its boundaries. One of the premiere globulars is M4. Glowing at magnitude 5.7, you should spot it with the naked eye from dark skies. Its short distance of only 7,200 light years makes this globular one of the closest in the night sky. If haze or light pollution is an issue, M4 is a mere 1.3 degrees to the south west of Antares. The cluster’s population is about 100,000 stars and is almost as large as the full Moon. Not as impressive but a must see is M80. At magnitude 7.2, it is a bit fainter than M4 and takes up about a third the size of the full Moon. Lying at 10 parsecs (32.6 light years) M80 was discovered by Charles Messier during a comet hunting session back in January of 1781. The cluster is void of noticeable stars and looks very much like a comet. A nova was discovered back on May 21, 1860. T Scorpii as it is now known, brightened to magnitude 7.0 but faded to past 10th a couple of months later. For a very different looking planetary, try finding NGC 6072. The challenge will be spotting it at magnitude 13.6 and to add to the mix, its declination is -36 degrees. You will need a good horizon and transparent skies to nab this one. Photography would be a better bet in capturing it. 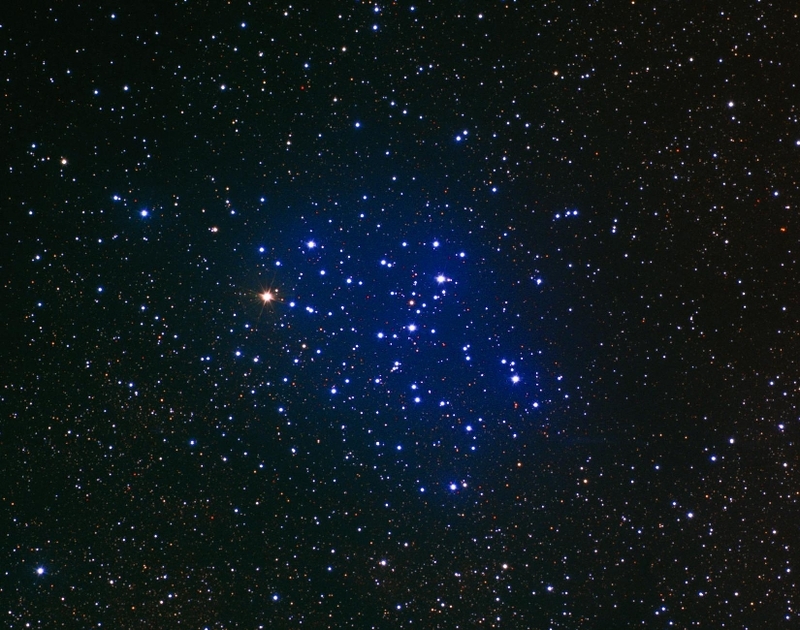 One of the largest and closest open clusters is M7. Measuring close to three full Moons in width, this jewel is a mere 800 to 1,000 light years down the cosmic road. This collection of 80 suns shines at magnitude 3.3 and is easily spotted between the Scorpion’s stinger and the tip of the Teapot of Sagittarius. I remember seeing its reflection on a very calm lake a few summers ago. Using binoculars, I was able to resolve stars in its watery reflection. This year’s Perseid meteor shower peaks on August 12th at 2 p.m. eastern time. This means you will have the night of the 11th or 12th and hopefully both, to see the yearly display. Third quarter Moon occurs on the 13th, so you will have to deal with some interference. It was fifteen years ago this past July 16th that the first fragment from Comet Shoemaker-Levy 9 slammed into the Jovian clouds – leaving its mark behind. To me, this was the greatest astronomical event I have ever seen. At the time it was said that witnessing such an event was once in a millennia. Well, the king of the planets got hit again. Australian astrophotographer Anthony Wesley came across the bruise on July 19th during a photo shoot. He imaged that same area two nights prior and nothing was there. You can follow this temporary scar on the next little while but the once oval mark is now elongated and appears to be stretching out. At the time of writing this article, it is still not certain what hit Jupiter. The great planet will also be at opposition on the 14th thus rising at sunset and setting at sunrise. Hands down the portrait at local side walk telescope sessions and public star parties. Since Jupiter’s equator is still lined up to us to a certain extent, we are still witnessing Jovian satellite transits of each other. Here is a list of dates, events and times given in Universal Time. The planet Saturn is found in the west low in the constellation Leo the Lion, twenty four arc minutes north east from Sigma Leonis. We are a mere weeks from the much anticipated ring crossing. This will occur on September 4th and for one night; Saturn’s rings line up directly with Earth with the one kilometre wide rings disappearing. The timing unfortunately has the Saturn only eleven degrees from the Sun. Being a low five degrees above the horizon at sunset with turbulence pulling at the image, photography and observations might be a challenge. Full Moon occurs on August 6th at 00:55 UT. And since it has been a couple of weeks past the total solar eclipse of July 22nd, the Moon will undergo a penumbral eclipse at the same time. But with a change of less than one magnitude, its not even worth staying up for. However you can try photography as the human eye will not pick up this subtle change.